OK This post will contains liveblogging about morning sessions of #mosc2010 day 2. Due to someone actually spamming the twitter, i had change the liveblog rules to showing only my related tweets. 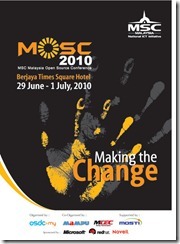 When i reached #mosc2010, im able to catch the keynote given by microsoft guy Gary Sweeting. Actually its not the first time i heard about the microsoft cloud (the 1st time was at the wordcamp last month), but i still able to learn something from there. At least from what i can tell, Cloud topics are all over this year’s #mosc2010, and quite obvious cloud and virtualization is the future! After that, i went to Foundations for Cloud Computing which talks about very basic stuff about Cloud Computing, essential things u need to know about cloud, which is very good for newbies like me who havent fully understand the cloud before that. Now, at least i have more knowledge about the cloud. Before the lunch, MPEG hardware encoding in the implementation of a Digital Video Recorder – Sharifah Ummu Kulthum Syed Abdul Rahman, IIUM, Malaysia session is the one i went to, nothing much, just talk about using your computer as an DVR, which i dont “buy” that idea very much as i think Internet TV is the future, Nobody watch TV, they stream it, watch videos on demand, download it etc. Recording Astro or RTM? What a waste of time and money and energy….